A multitude of beautiful parks and beaches await you in the Silver Lake area. Whether you're looking for wild excitement, or quiet serenity, there's a spot reserved just for you! 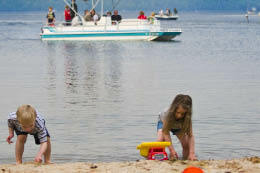 Crystal Lake, located south of Hart, is a spring-fed lake that's perfect for swimming and fishing. It features a small boat launch and on the east end of the lake, a large public access area. 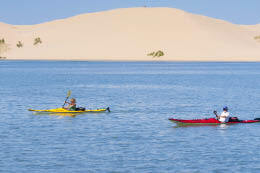 State Park Pedestrian Beach, on the west side of Silver Lake, allows you to enjoy the Silver Lake Sand Dunes. Park in the pedestrian area parking lot and walk to the beach. Silver Lake State Park Campground Beach can be accessed by the general public, but a day pass must be purchased at the campground registration booth. Here you'll find everything for a great day--sandy beach, picnic tables, pavilion, restrooms, boat launch, and a spectacular view of the Silver Lake Sand Dunes. 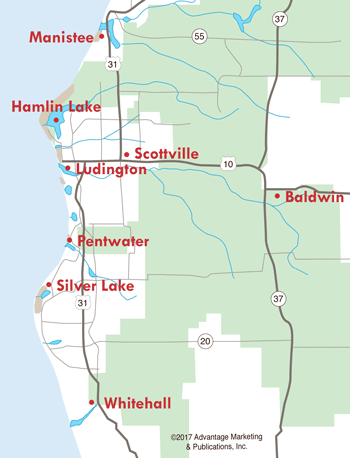 Welcome to nearly 2,000 acres of rolling sand dunes, bordering Silver Lake and Lake Michigan. Located on Lake Michigan, you can only gain access with an off-road vehicle, and if you don't own one, rentals are available. You'll find the entrance to this beach off 24th Avenue in Silver Lake. Whiskey Creek Public Access, named for the small creek adjoining its south side. This quiet, intimate Lake Michigan beach is located off B15, south of Stony Lake on Park Road.